"Choosing the right solution for Sales Process Management"
Sales Process Management (SPM) is a key functionality that can lead to increased cross-selling and up-selling opportunities, ultimately contributing to enhanced sales growth revenue. Choosing the right solution for Sales Management Process can make a tangible and quantifiable impact on a company’s bottom line and become a key driver of company’s profitability. 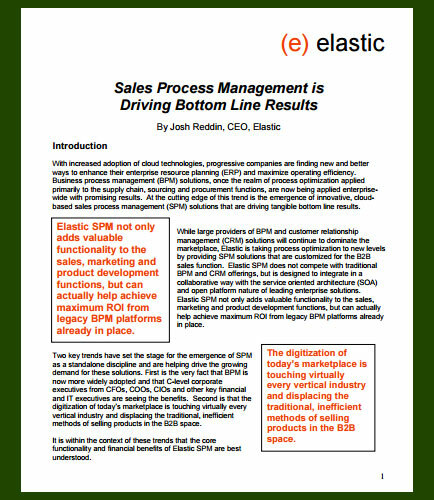 Elastic, a leader in providing complete and compelling B2B digital solutions, has come up with the Elastic Sales Management Process (SPM) solution, which resulted in wide adoption of Business Process Management (BPM) platforms in driving the trend towards enhanced functionality and more efficient management of the B2B sales process. What are the key trends for setting the stage for the emergence of Sales Process Management (SPM)? Which Sales Management solution/tools provide maximum sales growth? How to achieve efficiency driven cost savings across multiple dimensions of the B2B sales process? What is Elastic Sales Process Management (SPM) and what are its benefits? How can sales team efficiency improved with the adoption of SPM solution? Learn how Elastic Sales Process Management can help you create incremental revenue by cost management and maximizing sales growth opportunities.